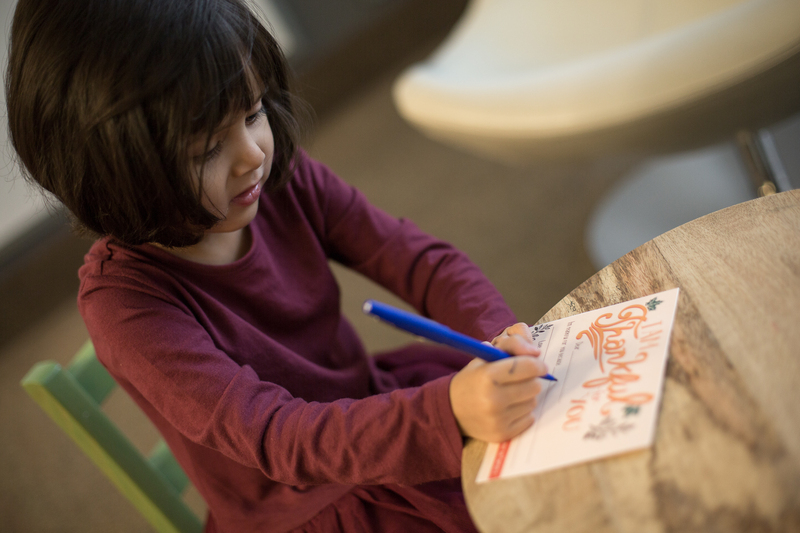 Thank you cards are an easy way to teach your kids about being thankful this holiday season. We encourage you to download and print out these thanksgiving cards and fill them out with your kids. Before you had kids, what did you want them to be like? What qualities did you hope they would intrinsically have? For me, gratitude ranked pretty high on my list. I wanted my children to have thankful hearts. And after your kids make their debut onto this earth, I bet you worked really hard to teach them the importance of saying “thank you” – right? Hearing your child’s little voice say those two important words is like hearing the embodiment of gratitude. When our kids show gratitude to other people in public, we feel like we have mastered this parenting gig; bonus if it’s without being asked. But how do we take the lesson from a verbal cue to a matter of the heart? Can thankfulness be taught? My vote is yes. For the month of November, I’ve been working with my girls on the idea of being thankful for the people who help us. At first, I was mainly thinking I would talk to the girls about their teachers, grandparents, and special people in their lives. I quickly realized that my girls were excited to show gratitude to and for many people, even those they meet only once. Their energy around showing gratitude has exploded in a short time. 1. Pray with a thankful heart. Ephesians 5:20 tells us to “always be thankful to God.” Each time I pray with my kids, I always try to model a thankful heart. It’s important for us to show our kids that no matter how bad things are, there is always, always something and someone to be thankful for in our lives. I like to ask my daughters who and what they are thankful for, and they have fun listing out all their classmates, teachers, and family members. It’s okay if their list seems to have no end. Try not to cut them off and just embrace their thankfulness practice. 2. Seek out people to thank. Every morning, I tell the girls that we are on a mission. We are looking for people to thank. We’re also asking God how he can use us to bring light into others’ lives. My three-year-old takes this challenge very seriously, and I’ve seen her flourish as she finds new ways to brighten someone’s day. I’ve seen her sweetly shout out to a drive-thru cashier, “Hello! What is your name? Thank you for your help today!” This experiment has made her look for people who aren’t looked at and notice people who need to be noticed. I know most people aren’t fans of writing thank you notes, but I believe everyone is a fan of receiving a thank you note. And isn’t it infinitely better when you receive an unexpected note that isn’t thanking you for the Target gift card but for the way you impacted their life? I’m helping my girls write “I’m thankful for you” notes, and we’re handing them to people we may know really well and see every day, and others we see bagging groceries or delivering mail to our front porch. We’re talking about why we are thankful God placed them into our lives and what our days would be like without those people in them. Each of these three practices can be woven into your normal day. It takes a little thought in the beginning as you initiate the ideas, but I promise your kids will take the lead fairly easily once they see the people around them light up. Let’s take this opportunity to not only be role models for our kids but to also invite them into the world of being grateful and showing our gratitude.